Do you need a quick gift for someone? This quick table runner is a super quick and easy sewing project you can make. This would also be a great beginner sewing project. You should be able to complete this project in less than an hour. It could be as little as a half hour or less depending on what embellishments you select. Click below to watch our free video tutorial or keep reading for a photo tutorial on how to make this super easy table runner. Also, look below after the tutorial for links to purchase supplies for this project. By purchasing supplies through our affiliate links below, we receive a small commission and you help us to keep making more projects. 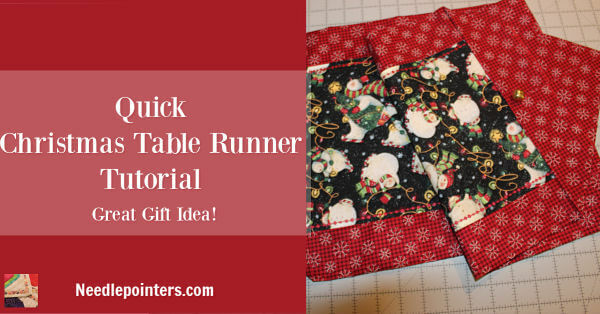 Click to watch the How to sew a quick table runner (Less than 1 hr!) video in Youtube. These are the fabrics selected for the table runner. 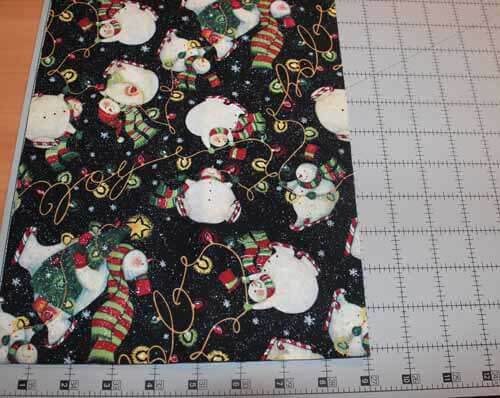 The Snowman fabric will be the feature fabric on the front of the table runner. The red snowflakes will be the sides and back. 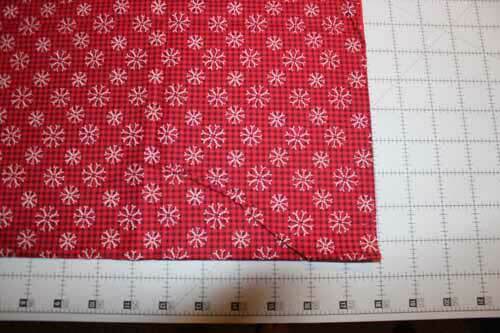 Cut your back fabric 18" wide by width of fabric (WOF). 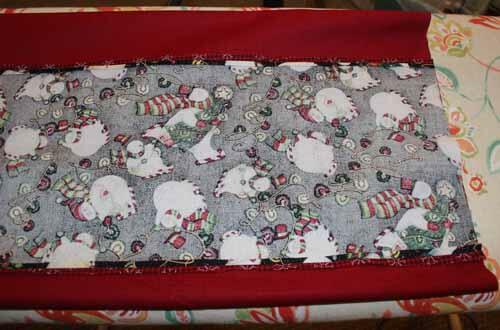 Later you can adjust the length of your table runner by cutting some off or leaving it as is. Cut your feature fabric 9" - 12" wide by width of fabric. I cut mine at 9" wide because I wanted to see more of the background fabric on the sides. If you cut it wider, there will be less background fabric showing. So, choose a size anywhere between 9" - 12" and cut your fabric. 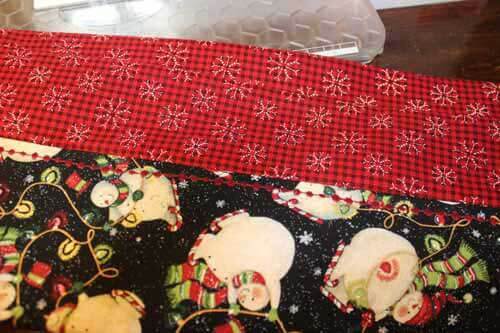 Next, lay your two fabrics right sides together with the long edges matching (see video for details). 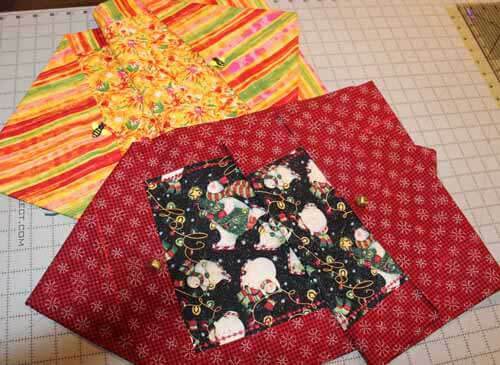 Pin one long edge together and sew it with a 1/4" seam allowance. 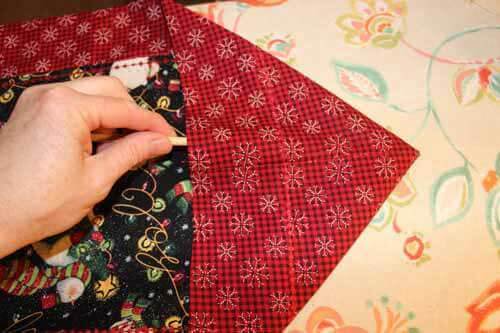 Continue by matching the other long edge together, pin and sew at 1/4" seam. You will now have a tube. 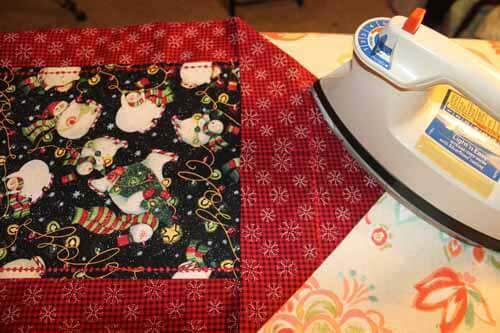 Go to your cutting mat and trim off the selvages on each side of your table runner. If you want to make your runner shorter, this is when you would adjust it by cutting more off. The points of the finished table runner will be about as long as the fabric (minus about 1/2" for the seam allowances). 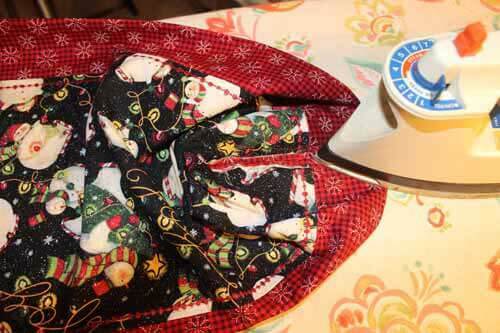 At your ironing board, lay your runner flat and iron the seams open. You could also iron them to one side. 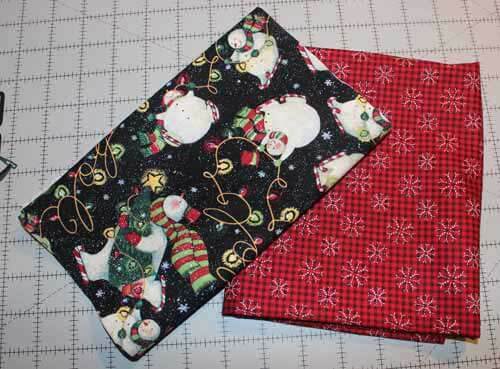 Next, turn your fabric so the right side is on the outside. 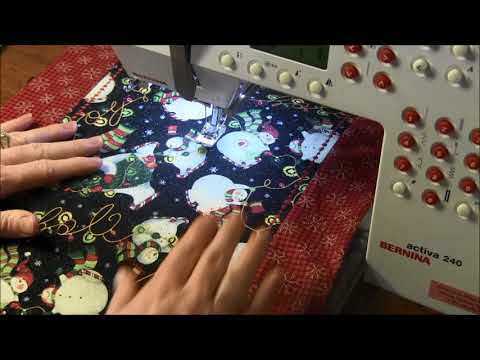 Then, center your feature fabric on the front and iron it flat (there are more instructions on centering in the video). To center your feature fabric, use a ruler to measure each side fabric and make sure it's centered properly and adjust as necessary. Measure at intervals all the way down the runner to make sure it says centered all the way. Next, you will need to decide what type of finishing stitch you will want to add to the runner. You can also decide to skip this step but I think it adds a nice finishing touch and also will help once the table runner is washed. It will be easier to get it back into shape if there are stitches holding it together. 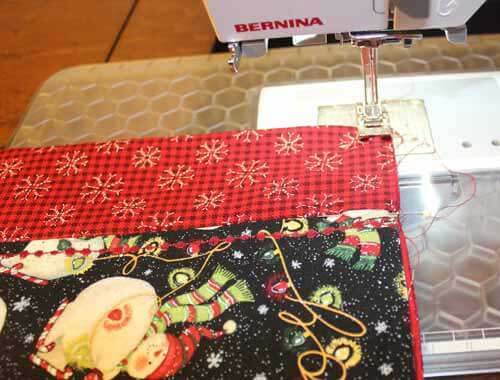 This is a great project to use some of those decorative stitches built into your machine! 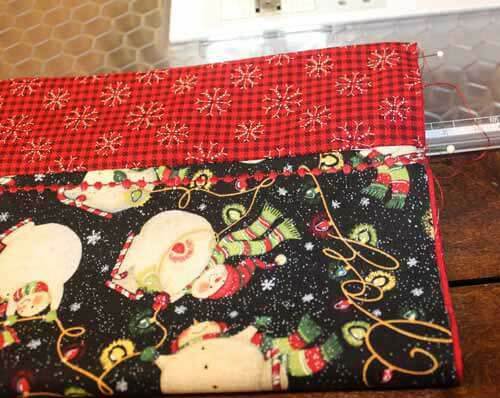 If you don't have decorative stitches, don't worry, you can use a straight stitch also. Some options you have for the stitching. 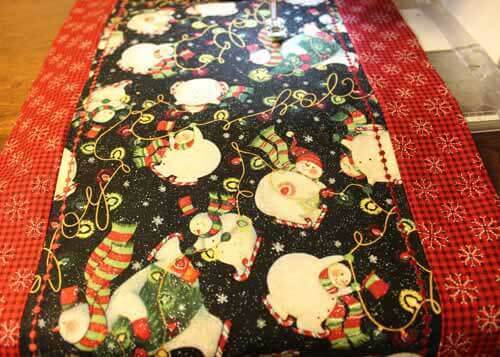 * Add an edge stitch along the edges of the table runner. This is a close up of the decorative stitch I used. Now for finishing the ends. 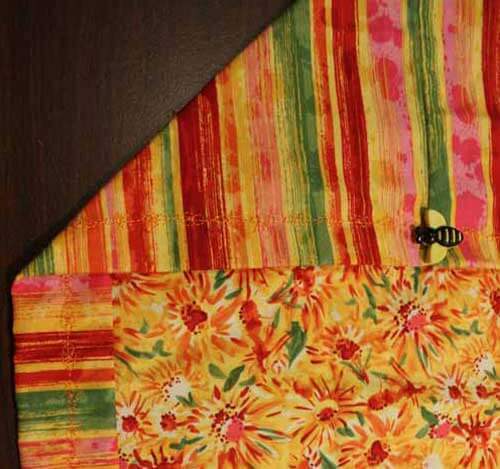 Take your table runner and fold it with the back side together as shown. You should see your feature fabric towards you. Match the edge of the runner and pin to hold in place. Also, match the seam and pin to make sure it doesn't shift. Sew with a 1/4" seam allowance to finish the ends. Do this on both ends of your table runner. At your ironing board, iron the end seams open. Next, flip the seam under to make a point. Use a pencil or turning stick to push the point out nicely. Iron the point flat. Do the same on the other end of your table runner. Now you have the finished ends of your table runner and it's almost finished! 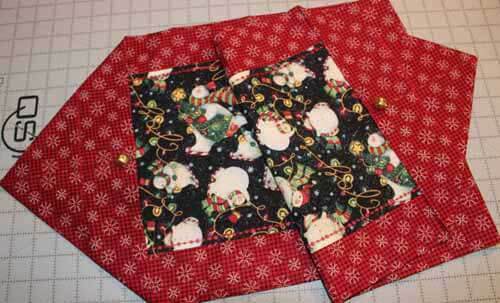 Finish your table runner by hand sewing a button, bow, yo yo or other embellishment to hold down the ends. If you don't want to add an embellishment, just put a few stitches to tack the ends down. This will help when you wash the runner to keep it in shape. Now you have a finished table runner. Wasn't that quick and easy? Here are the two table runners I made. 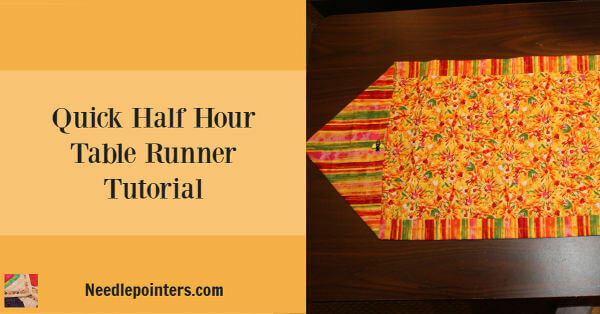 The orange runner has a wider feature fabric, so notice that there is not as large a border. I also used some cute bee buttons on mine. This is the full finished table runner. This is a close up of the stitching on the first orange table runner. 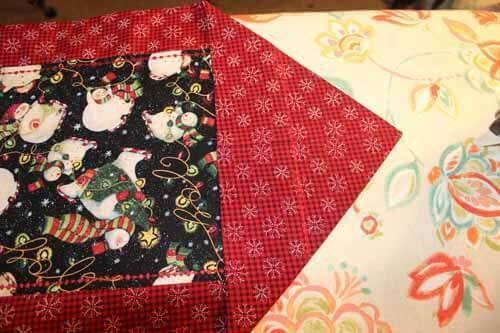 Make these table runners for Christmas, birthday or other holidays. These table runners would make great teacher gifts too! We hope you enjoyed this project! 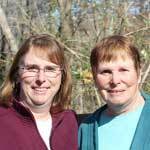 Please look at the links below for some supplies you could use to make this project.